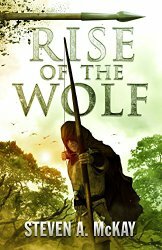 Rise of the Wolf is the third installment of best-selling historical fiction author Steven McKay’s wonderful Forest Lord series. Set in Barnsdale Forest in Yorkshire Yorkshire (rather than the more familiar Sherwood forest in Nottinghamshire), McKay’s reworking of this classic tale is masterful. Rather than drawing on the folklore that gave rise to the Robin Hood stories that most of us have all grown up with (and that Hollywood has done to death – almost literally), McKay taps an alternative – and much older – literary vein: the original fifteenth century Robin Hood ballads. Like the recent reboot of the Star Trek, this move opens up all sorts of possibilities for developing new stories and for deepening and enriching characters we thought we new, and once loved, but that have become shopworn and more than a little campy over time. More about this below, but MacKay’s Robin Hood is certainly not the Robin Hood played by Errol Flynn in the 1938 film, The Adventures of Robin Hood; nor, mercifully, is he the Robin Hood played by Kevin Costner in Prince of Thieves. Rather, he is a complex, multilayered and therefore realistic character, simultaneously embodying a rough chivalry (and increasingly well-developed sense of fatherhood) and an ever-evolving capacity for brutality and violence. Ok, you might be thinking, McKay has done something interesting and significant with this series. That’s great. But what can you tell me about this particular novel? What can you tell me about the plot, setting, character development, dialogue, action, etc.? Is it a cracking read or a tedious one? Should I shell out my hard-earned dollars, pounds, euros or whatever and buy it – or should pass on this one and buy another (and there are a lot of good histfic novels out there)? Well, I won’t delve too deeply into the nuances and details of the plot, for that way spoilers lie. What I will say is that this is a story of the quest for revenge. Robin’s old nemesis, Sir Guy of Gisbourne, is out to avenge the horrific disfigurement he suffered at Robin’s hand in the previous book, and will not be satisfied until Robin is made to die as painfully as possible. Aided by the despicable turn-coat Matt Groves, Guy pursues Robin and his band of merry men with a recklessness and determination born of his lust for vengeance. The result is an action-packed, rip-roaring tale involving battles, chases, ambushes, betrayals and even an execution – all set in a narrative that charges along at a speed that will have the adrenaline pumping through your system from start to finish. As to the characters, I can only say that McKay has done an excellent job of bringing the people who populate Robin’s world to life. Whether major characters or minor, almost everyone in the novel is given depth and humanity. This, I think, is where McKay shows real growth as an author. Not that the characters in his earlier novels or wooden or one-dimensional. They most assuredly are not. But in Rise of the Wolf McKay has upped his game considerably. The evolution of Robin and Sir Guy; the interior life and motivations of the great (King Edward II, for example) and small (Robin’s sister Marjorie); the historical sensibilities of all the characters – all these are revealed in ways that lend colour and nuance to the story, making it both more interesting and more believable. For some readers, the most important thing in an historical novel is to get the exterior details – clothing, food, geography, weather, etc. – correct. I’ve always believed, though, that while these details are important if one is to transport the reader into a different historical reality, far more important is to get the details of the interior life correct. McKay has always been good at this, but in Rise of the Wolf we see a whole new level of maturity. This is the best Robin Hood you are ever going to encounter (until, maybe, the next installment in the series), not because of what he wears or eats, but because of what and how he thinks. Finally, this being a work of Steven McKay, the fight scenes are unflinchingly bloody and unrelentingly adrenaline-inducing. When it comes to historical fiction, I like my fights/battles to be dramatic, realistic, necessary (in the sense of advancing the plot or revealing something about an important character) and very, very bloody. McKay has always delivered in this respect and Rise of the Wolf is no exception. Bottom line: I can’t recommend this novel strongly enough. You should buy it now. And if you haven’t already got your hands on the previous two novels, you should buy them too. Simply put, if you’re a lover of historical adventure stories in the mold of Bernard Cornwell you’re going to love all three novels in the Forest Lord series. In my opinion, though, you’re really, really going to love Rise of the Wolf.